Henning went overseas recently. When he came back, there was the usual ceremony of gifts from afar. Me: 'Wonderful!' Thinking: not. I'm not much of a chocolate eater and when I do, I prefer supermarket brands to the fancy-schmancy imported stuff. Hmm. The tin is pretty. It would be ideal for keeping pencils. Whoa! Look at those wrappers. Each one has a reproduction of a classic painting printed on glossy paper. I could frame them and hang them in my dollhouse. And there's a pencil. Multicolor, no less! I haven't had one of those since I was a kid. Writing with it is going to be so much fun. Me, holding out the tin to Henning: 'Would you like a chocolate? Mind you don't tear the wrapper or the foil.' Thinking: The gold foil is going to come in handy for making dollhouse Christmas decorations. That my friends, is how you engineer a win-win situation when living with a miniaturist. All parts appreciated, except the chocolate, which was eagerly devoured by the man with a sweet tooth. Mini-wise, I'm working on a village of tiny houses at present. They are cast in resin and hand painted. Initially, I had misgivings about my mini painting skills but as I go along, I'm becoming addicted to the process and loving how I can individualize every building. I'm not only playing with miniatures. A large shipment of teddy bear making supplies arrived and I'm busy unpacking and adding new items to the website. Glass eyes and smaller sizes of safety eyes which were out of stock are available again. 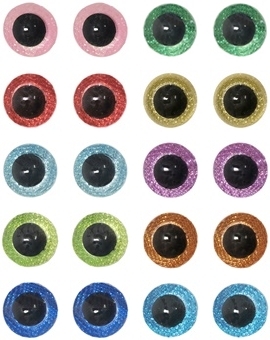 These pretty colored safety eyes come in several sizes and have a glitter backing. Difficult to photograph, but stunning in real life. Velvet noses and other goodies are on the website already and the eyes should be on the site by Wednesday. Wishing you a sweetly creative week. I can't wait to see your framed chocolate pictures! Sheila, I've been wanting to make some miniature picture frames for a while. Now I have someting to put in them, I think I will be inspired to get to work! Personally I NEVER say no to chocolate, but that tin... UM, what a delicious gift. Ha Sam, cheap chocoholic has a certain ring to it. I love the way miniaturists look at the world in terms of things that can fit in a dollhouse. It's like we're 5 1/2 inches tall in our minds or something. I recognise very well your story of receiving a gift, they are true sources of mini inspiration and why miniaturists can't stop thinking what they will create of these things ;O! The tin and the wrapping are beautiful, you now have perfect miniature paintings, Megan. These self made tiny houses are lovely to see. I'm glad your new stock for making teddy bears has arrived and to see you back into the creative world again. I'm thinking of ways to make the paintings look more realistic, Ilona. I think some streaky layers of ModgePodge so that they look more like they were painted on a canvas is a good idea. I'm having so much fun with the little houses. Have fun creating this week, I can't wait to see what you do next! I have been known to choose chocolates purely by the usefulness of the container. Although I do love chocolate too.... so that's win-win. Never seen anything quite so exquisite as yours though... complete with a multicolour pencil! Sandra, the chocolates are Feodora, from Germany. Apparently, the brand was named after a German princess. I believe there's a whole series of paintings on tins. Normally, that would have me buying a plane ticket to go look for the rest of the tins. I can't stand having an incomplete collection of anything, but this time I think I'm going to be happy with just the one tin. One can only have so many paintings in your dollhouse, after all! Hi Megan! It's great to have you back and see more of your adorable resin houses! I'm glad you're finding some time for creative pursuits! I am a migraine sufferer, like 9 a month, so many delicious foods, chocolate included, are pretty much out for me. I do like chocolate, and tend to have cravings for it, but after many attempts which lead to horrible brain pain, I know better! It is great of you to see the glass half full and be able to utilize the packaging as the gifts! Those eyes are truly beautiful and I'd love to see them on a bear in person! It seems like all my teddies growing up had standard brown eyes. Happy sales! I'm having so much fun with the little houses, Jodi. Migraines are no joke and that many sound like cuase for concern. I used to get a migraine every once in a while. Eventually I figured out that the triggers for me are coffee, oranges, and cinnamon. Eating two of those in combination are a 100% guarantee to get sick. So I stay away from those foods and mostly I'm fine. I hope over time you will get better too. As you know, I'm supposed to be a teddy bear maker by profession. Lately I've been sidetracked by dollhouses but honestly, I've always preferred miniature bears and dolls. My bears have traditional shoe button black eyes though, I'm not a fan of colors. So many people crochet and knit toys these days, most of my sales are to ladies making kids' toys. About the chocolates, I'm well familiar with the situation, especially when the foil comes in various colors which can make little chocolate candies in a box. But I also love the chocolate that comes in them. Your tiny houses are very sweet. Painting them must be fun. How wonderful that you got those lovely bear eyes. I'd love to see your bears. Drora, I only got gold foil with these. As I was opening them and hoping for a surprise, I realised that I haven't seen other colored foils in a while. I will have to go shopping for more chocolate so I can restock my wrapper collection, haha. Thank you for liking my mini houses. Yes, it's time I show some of my bears again. I've been taking a break from bear making and it's been too long. Rosa, next time I'm inviting you over to help me eat the chocolate! Isn't that the greatest thing about miniatures, Elizabeth? We find delight in everything! Years ago, I was a member of a gem and mineral club. We used to mount stones on dowel sticks with hard wax in order to cut and polish them. It's a habit that's stayed with me whenever I'm working with small things. So much easier to handle them when they're ona-stick. I was talking to my mini partner in crime yesterday, and realised that we also need gingerbread houses, haunted houses, and glitter houses for Christmas. Looks like I'm going to be busy with little houses for a while yet! What I really like about these is their tiny size. They're between 20 and 30mm tall, perfect for a dollhouse mantlepiece, bookshelf, or display cabinet. Hi, Megan - You made me laugh, describing your interest in the chocolate tin, the painted wrapper, and the foil - everything but the chocolate itself! It's surprising that so many mundane objects (not that chocolate is mundane!) are packaged in fascinating wrappings and containers that just cry out for attention from a miniaturist. I love your tiny resin houses, and I think you're doing nice work on the painting. You must have a very steady hand! Marjorie, I love the way a miniaturist can look at something like a dental floss cannister and see everything from a toilet cistern to a planter or a kitchen fitting. I have to confess that my imagination is not always as good as others' but I surely try! Thank you, I'm having lots of fun with the miniature houses. Feodora chocolate often comes along with lovely illustrations, especially for Easter or Christmas, which are tempting to be kept for purposes like cards etc. - but the painters' edition your husband gave to you is of course perfect for a miniaturist. I see Henning knows well how to make you happy - and doesn't forget about himself. ;O) I've just torn the wrapping of my chocolate Santa apart for making Christmas candy - it was fantastic because this did not only offer red foil but also a lot of white - so I'm very familiar with "beware of the foil"-remarks. I'm wishing you loads of fun with your rainbow pencil and your picture gallery - and your tiny houses are awesome and very well painted. Your collection of eyes is beautiful, I bet your own bears as well as those of your customers will get a great look with these. Hmm, I will be looking for more Feodora tins for sure, Birgit. Henning also brought some Niederegger marzipan. That I eat, and as a bonus, it comes in red foil for my dollhouse stash. Me encantan esas casitas, y es genial que los chocolates puedan aprovecharse tanto para comer, como para decorar nuestras casitas !!! Gracias, Eloisa! Estoy teniendo muchas aletas con miniaturas este año. Beautiful can with beautiful chocolate wraps, oh yes we can use almost anything. Gonda, it is always tempting to add little pieces of plastic and paper to my stash. Then invariably when I need something, I go to the art shop and buy it! But I do have good intentions to use my stash this year. A beautifully written and humourous post. You have hit the nail on the head. The excitement over a tiny treasure of potential that so few can recognize is truly a gift. Are we giving your better half credit for recognizing the usefulness of the wrappers of the chocolates? I am sure he took it in any case once he saw your reactions. Your little houses are sweetness itself and such a good hint for us to put things on the dowel sticks. PS Sometimes I cannot post a comment but I always visit you. It is not only your blog but seems to be on my side. J. Thank you, Janine. I'm continuing with the little houses and Henning's ego is big enough, we don't need to help him along, haha. Google is making more changes this month, I hope soon all our commenting problems will be a thing of the past!